Houlder has been developing ssLNG infrastructure steadily over the last five years. At the beginning of 2017, it announced a memorandum of understanding with specialists KLAW LNG. This new collaboration built on both companies experience to develop new bunker and transfer solutions in response to the increased potential reported by PwC. 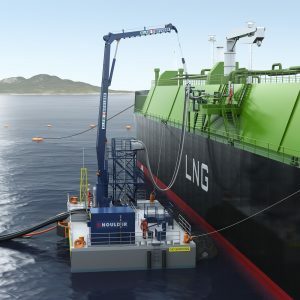 The joint Houlder / KLAW LNG team are working together to deliver the KHobra systems providing safe and efficient Ship-to-Ship and Shore-to-Ship LNG transfer. Alongside any new equipment, the collaboration offers clients a full set of services available world-wide including vessel installation and integration, site assistance and support. The KHobra transfer system is a key component of a Floating Transfer Terminal self-propelled barge (pictured below), developed by Houlder, Wärtsilä and Trelleborg, that shuttles to and from LNG vessels moored as far as 800m offshore. Trelleborg CRYOLINE LNG Floating Hoses can then transfer of LNG and Boil Off Gas between the barge and any shore facility without a fixed jetty. The FTT is a flexible, quickly deployable solution that, thanks to a low draft barge and floating hoses, can operate in the widest possible range of locations at a fraction of the cost of fixed infrastructure. You can read the PwC report here.